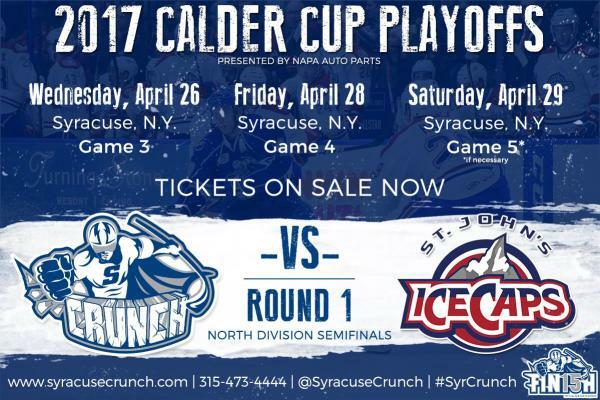 After two games on the road, the Syracuse Crunch are returning home to host the third game of the first-round of playoffs. The series is currently tied 1-1 after Syracuse defeated St. John’s in Game 2 with a nail-biting double overtime win on Saturday, April 22. The Crunch will play the remainder of the series at home, with Game 3 starting at 7 p.m. on Wednesday, April 26. Game 4 will be played on Friday, April 28 and if necessary Game 5 on Saturday, April 29. Game 5 will only be necessary if Syracuse splits the next two home games. If you’re keeping track that means the Crunch only need 14 more wins to get to the Cup, so here are 14 UPDATED fun facts on the Syracuse Crunch. We hope to see YOU there to cheer Syracuse on to the next round. 1. Series to Date: Syracuse, which lost their first game of the series, 2-1, came back from a two-goal deficit in the final five minutes of play to tie the second game 3-3. After a scoreless overtime period, Tye McGinn netted the game-winning goal halfway through the second overtime. 2. McGinn for the Win: Syracuse’s McGinn has been on the ice for all five of the Crunch’s goals netted during this year’s playoffs. McGinn scored the game-winner in Game 2 as well as Syracuse’s lone goal in Game 1. 3. The Fourth & Fifth Period: Saturday’s double overtime game was the third OT game of the 2017 playoffs and the first double overtime Calder Cup game since Lake Erie defeated Ontario on May 26, 2016. The 2016 playoffs featured two double and one triple overtime games. So far, five games have gone into at least one extra period during the 2017 playoffs. 4. 2OT: The Crunch earned their first ever double overtime win in franchise history with Saturday’s game-winner. 5. Hot Hands: Matt Taormina and Matthew Peca currently lead the team in points (3) while McGinn’s two goals top the Crunch in scoring. Taormina has 1 goal and two assists while all of Peca’s points come from feeds. 6. Something in the Water: Syracuse’s Kevin Lynch and St. John’s Michael McCarron both hail from Grosse Pointe, Michigan and both play at center. Coincidence? 7. One and Done: Five different players have scored St. John’s five goals of the series, while Charles Hudon leads the IceCaps with three points (1 goal, 2 assists). 8. Young Blood: The average age of a Syracuse Crunch player is just 24. 9. You Make 100% of the Shots you Take: Syracuse’s regular season leading scorer, Cory Conacher, currently leads all playoff skaters in shot percentage shooting a perfect 100 percent in the playoffs. Maybe he can celebrate his top spot by seeing his favorite artist, Luke Bryan, this summer at the Lakeview Amphitheater (Aug. 12). 10. A Playoff First: Defenseman Slater Koekkoek netted his first career post-season goal in the win against St. John’s on Saturday. Koekkoek tallied 13 points during the regular season off of two goals and 11 assists. 11. Crushing Hard: Team captain Erik Condra, Ben Thomas and Daniel Walcott all named Margot Robbie as their (not-so) secret celebrity crush. Maybe the Suicide Squad star can drop the ceremonial first puck at next year’s opening ceremony? 12. Pints and Pups: During the regular season, Syracuse Crunch players participated in the Molson Canadian/Miller Lite Celebrity Bartending series at several local pubs including Bosco’s Village Pub, Bull & Bear Roadhouse, Smokey Bones Bar & Fire Grill and Cooper’s Landing. All tips and proceeds generated went to Humane CNY as well as other area charities. 13. “Sid” the Sloth:. Syracuse’s Mike Halmo and Tye McGinn took a trip to the Rosamond Gifford Zoo this season to hang out with some animals and promote the Zoo’s Half-Price Admission February. With McGinn seems to have a fondness for sloths we think he might enjoy another trip to the Zoo and show off some celebrity bartending skills while there with the annual Brew at the Zoo event, coming up in August. Watch Halmo and McGinn at the Zoo here and find a full list of upcoming Zoo events here. 14. Around the League: Only three teams currently hold a lead in their playoff series. The Hershey Bears are 2-0 against Lehigh Valley, Grand Rapids has a 2-0 lead over Milwaukee and the Charlotte Checkers are 2-1 against the Chicago Wolves. If the Crunch advance to the next round they will face the winner of Toronto vs. Albany. That series is currently tied 1-1 with Toronto hosting the next three games. The Crunch are slated to play Game 3 at 7 p.m. on Wednesday, April 26th at the War Memorial. They will play Games 4 and 5, if necessary, on Friday, April 28th and Saturday, April 29th. Tickets for all home games can be purchased through the Crunch box office at 315-473-4444 or the War Memorial Arena Box Office. Mention “Visit Syracuse” for a special discount on first round tickets.